Do you want to find out some of the business that you can venture into with less than 100k this year? 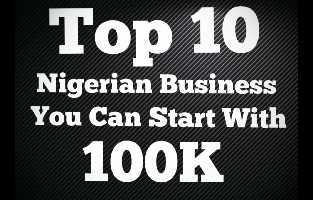 In this article we are going to take a quick look at some of the top 10 businesses to embark on with a small capital as low as 100k (one hundred thousand naira only). A lot of people save money in other to venture into different businesses,however there is no business without risk and the probability of failure. Knowing the type of business to invest in and how to carry out that business will however lower the chances of you losing your capital. Most of these businesses and side hustle has actually saved a lot of Nigerians during the recession period. Sale of Phone accessories is actually very profitable,almost everyone in Nigeria has a mobile phone and very often there will be need for them to change or replace an accessory of their mobile device such as the carry pouch,case or hands free / ear piece. You can star your mini import business by importing mobile phone accessories from China by using websites such as Ali Express. You can read how you can order items from China here. Some of the online sellers in China offer free shipping. Selling of boxers is actually very profitable and requires a low capital. Your best bet is to schedule a trip to Aba,make the purchase and make a re sale after which you will make your profit. This will definitely cost you less than 50k. According to sources, bed sheet production is quite profitable and can be sourced in Lagos Island, or Oshodi where bulk materials are sold and also sewed at a cheap price. If you cannot travel to Lagos,then you can consider visiting Aba. If you are looking for a hobby that will pay in the long run then you should consider starting up a blog. There are different types of blogs and you can blog about anything that you like. You can set up a blogger blog using blogger for free. Shirt production and sales is another business that you can start up using a low capital. You can consider learning how to sew and start up the production by yourself or you can buy at a lower price and make a re sale. To learn more shirt production visit Aba or Taiwo Street in Lagos Island. This can be done in areas where there is a large crowd and people cannot get quick access to banks,or are in a hurry and need to make payment. You can offer to handle e-payments for people. There are a lot of football fans in Nigeria that will like to customize their jerseys also there are people that are celebrating events such as birthdays,graduation etc that would need customized tshirts and outfits. You will need less than 100k to start up this business,all you have to do is to give the clothes of your clients to people that already have branding equipments,with time you can save money and buy yours too. Popcorn business is a money spinner,although it can be a bit stressful at first. A popcorn machine costs between N50k - N65k,this business doesn't need advertising because the aroma will definitely attract customers. A pack of popcorn costs about N40 to produce and can be sold between N100 - N200 Naira. This is a very profitable business venture to embark in,it's also very interesting especially if your still young and willing to learn,all you have to do is to find an experienced computer /laptop technician and learn from him or her. A lot of people smile to the bank on a regular basis due to their baking skills. You can start the production of small chops, cupcakes,chinchin etc and also produce drinks like zobo,smoothies etc.